Final preparations are underway for ElderCare Plus, the much-anticipated Eldercare Conference that has changed the lives of hundreds. This year's program will feature a tremendous array of information, ideas, and practical solutions, all designed to answer real-time questions culled from dozens of caregivers. A top-notch group of experts spanning every branch of eldercare (medical, financial, psychological, emotional, rabbinic, and technical) will address a myriad of sessions throughout the day, while nearly 50 vendors will exhibit products and services that can dramatically enhance lives. In addition to the return of the highly popular sessions on Medicare/Medicaid, nursing homes, dementia, financial planning, and self-care, special sessions added for this year include a new track for caregivers of special needs children and adults; focus on the long-distance child; nutritional information and demos geared towards nourishing caregivers and their charges; and the truth about hospice. 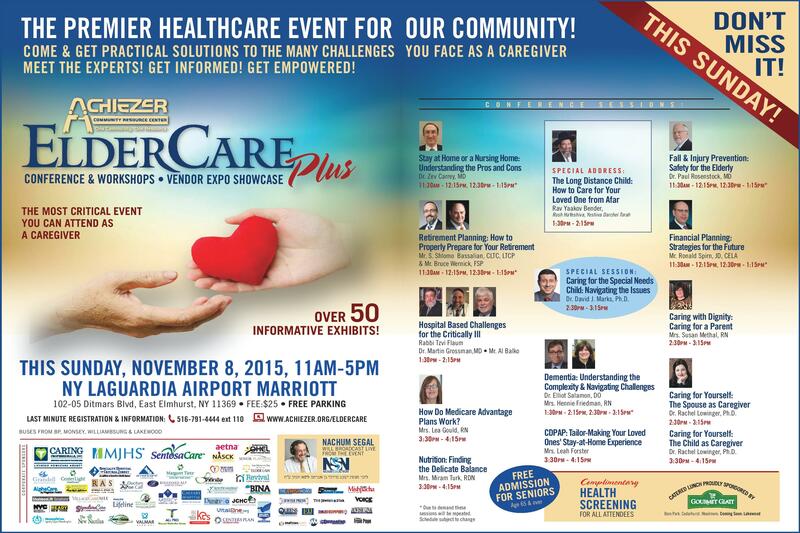 Slated to take place THIS SUNDAY November 8th at the LaGuardia Marriot hotel, ElderCare Plus is a one-day investment, which has the potential to lighten your load and help your loved one for a lifetime. Looking forward to seeing you there. For more information and to register visit www.achiezer.org/eldercare or call (516) 791-4444 x 110. Registration is free for seniors. Complimentary health screening for all attendees. *LIVE RADIO BROADCAST* Nachum Segal will broadcast LIVE from the event between 1pm-3pm. Broadcast is sponsored L'zecher Nishmas Yaakov Mordechai ben Avraham Lipa Hakohen. Dr. Rachel Lowinger, Ph. D.
Dr. David J. Marks, Ph.D.